This handy cooling large wallet is easily activated with just plain water. This special quality makes them a popular choice for travelers since no refrigeration is needed. 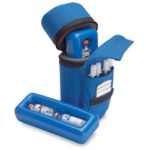 This diabetes case stays cool for up to 45 hours and can be re-activated hundreds of times. The Large FRIO measures 7 in x 5 1/2 in and can hold pens, syringes or bottles. Available in black and blue.